On the second Saturday of each month, we share a membership recruitment and retention tip on the PNW Optimist Clubs Facebook page. Most tips remind the reader to communicate better with their internal and external audiences, members and stakeholders. Some, like today, inform of best ways to sell the intangible product: membership. Take a read, please, and share with your Optimist Club for greater success. Membership retention and recruitment tip #54: Be less salesy. Perhaps you have seen this happen at a club meeting - the speaker has just completed her presentation and the chairperson stands up to thank them and before they are through, they are waving a membership application in the speaker’s face asking them to join. We often say that in order to recruit, we just need to ask, but there are some preparatory comments that will help you seem less aggressive when asking someone to join your club. Consider asking if the prospective member has belonged to a club previously, what they did or didn’t like about their experience, and what they might hope to gain by joining your group. These questions, among others, will start a relationship, gain their trust, and show that you and your organization cares about its members. 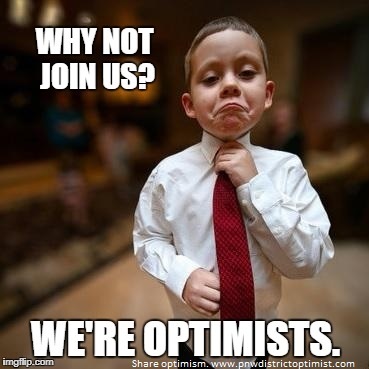 We invite you to join an Optimist Club. Click here to find an Optimist Club near you and get involved!